Pub/Sub enables event-driven architectures and asynchronous parallel processing, while improving performance, reliability and scalability. With Amazon Simple Notification Service (Amazon SNS), you can send asynchronous event notifications to a topic and all services subscribed to the topic will instantly receive the message. To learn more, review these resources which provide more information on the Publish Subscribe model and Amazon Simple Notification Service (SNS), including blogs, guides, tutorials, whitepapers and videos. You can also learn more about message queues, and message queuing services on AWS. Getting started with Amazon Simple Notification Service (SNS) takes just three simple commands. AWS Free Tier includes 1 million mobile push notifications, 1 million email deliveries and more with Amazon SNS. Describes all the API operations for Amazon SNS in detail. Also provides sample requests, responses, and errors for the supported web services protocols. Provides a conceptual overview of the Publish Subscribe model as implemented with Amazon SNS and includes detailed development instructions for using the various features. Find documentation for AWS Messaging services. Enterprises rely on messaging to integrate services and applications and to exchange information critical to running their business. However, managing and operating dedicated message-oriented middleware and underlying infrastructure creates costly overhead and can compromise reliability. 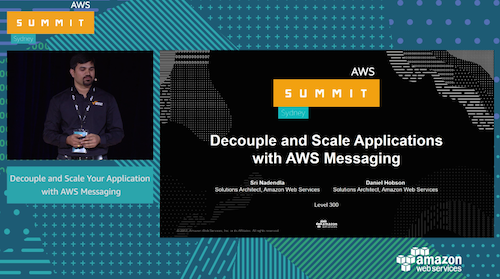 In this session, enterprise architects and developers learn how to improve scalability, availability, and operational efficiency by migrating on-premises messaging middleware to a managed cloud service using Amazon SQS. Hear how Capital One is using SQS to migrate several core banking applications to the cloud to ensure high availability and cost efficiency. We also share some exciting new SQS features that allow even more workloads to take advantage of the cloud. Enterprises rely on messaging to integrate services and applications and to exchange information critical to running their business. However, managing and operating dedicated message-oriented middleware and underlying infrastructure creates costly overhead and can compromise reliability. 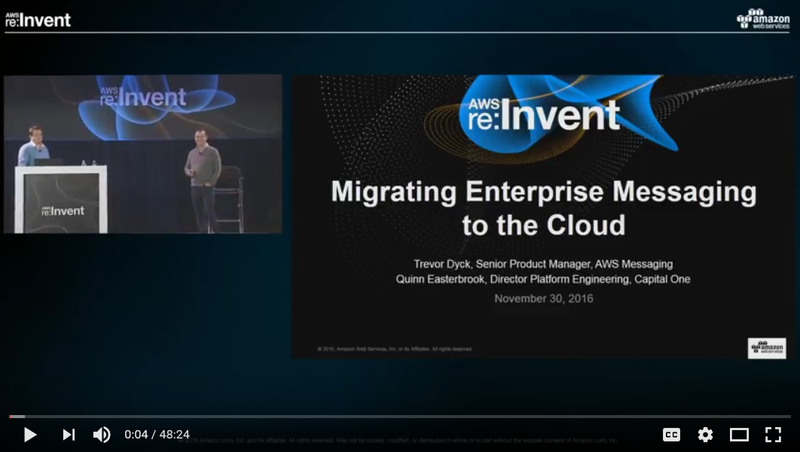 This video presentation shows how enterprise architects and developers can improve scalability, availability, and operational efficiency by migrating on-premises messaging middleware to a managed cloud service using Amazon SQS. Capital One shares how they are using message queuing to migrate several core banking applications to the cloud to ensure high availability and cost efficiency. Get started for free with just three simple commands.